The final game of the day. Always a bit of a bummer, unless you happen to be a Jets fan, in which case football no longer exists. 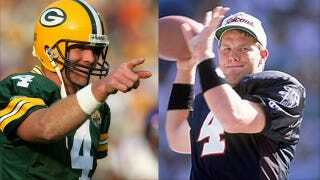 Green Bay at Atlanta (NBC): Of course Brett Favre will be mentioned this game. He virtually guaranteed it when he said he was surprised that Rodgers didn't win a Super Bowl earlier. That combined with his connection to both organizations and it's a perfect storm. Only this time, we're the little dinghy. Enjoy below!